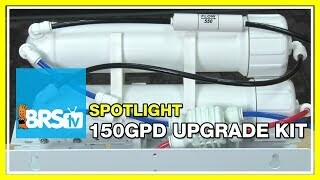 Water Saving Upgrade Kits are probably our most recommended RODI upgrade. If you have proper pressure (65+ PSI) we highly recommend installing the kit, because it will produce water twice as fast as a standard 75 GPD or 100 GPD membrane while cutting the amount of wastewater in half. 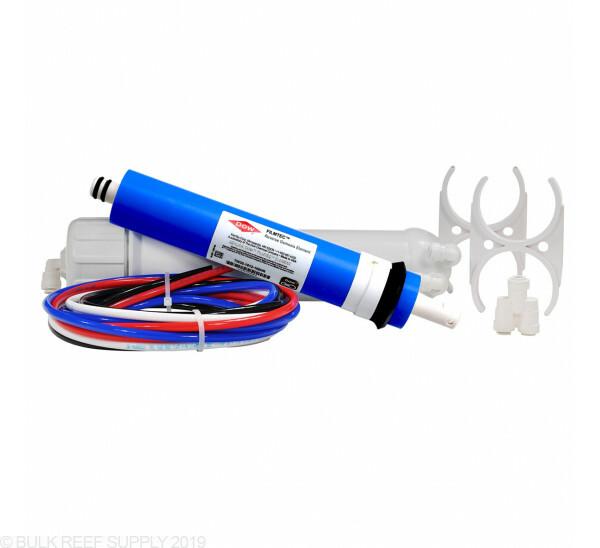 The BRS 150 GPD or 200 GPD Water Saver Upgrade Kit will increase the production of any BRS 75 GPD reverse osmosis system to 150 GPD or 100 GPD RO membrane up to 200 GPD without having to use any additional water. With the installation of this kit water production will increase from approximately three gallons per hour to six gallons per hour! It does require 65psi or more into the first membrane in order to function properly and be efficient. If your home's water pressure is less then the recommended PSI do not worry, adding a booster pump is simple and only takes a couple of minutes. 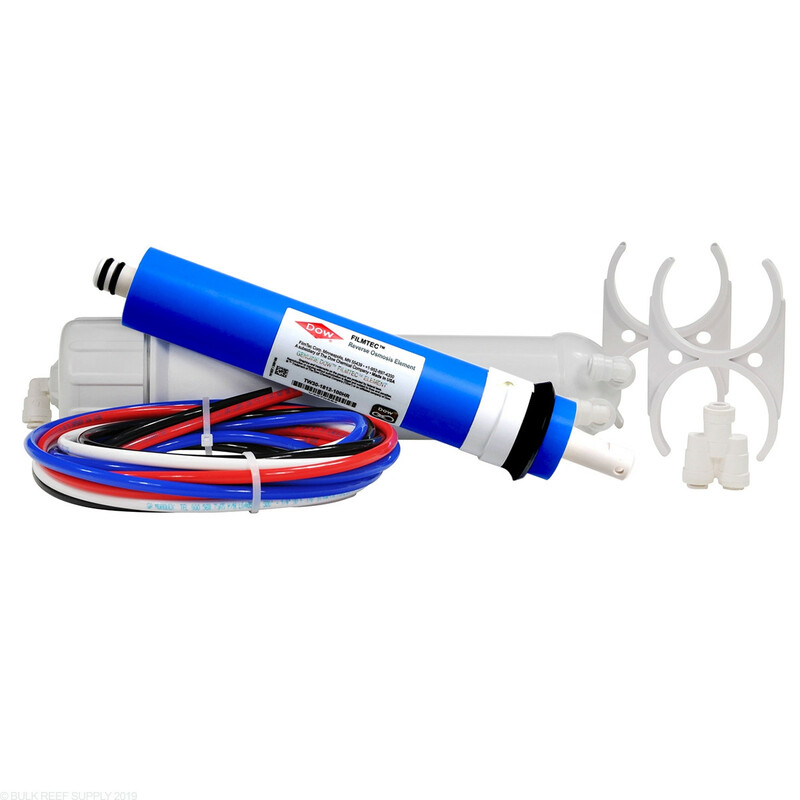 Water pressure can be increased by adding a booster pump before your RO/DI system if a pressure increase is required. Low pressure will cause slow production of product water, with excess production of wastewater. Pressure over 90 PSI may cause damage to the RO/DI units filters and components. 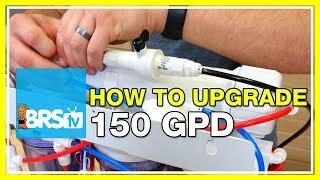 *High TDS - Source water with high TDS we do not recommend using the 150 GPD water saving upgrade kit. If used you may experience increased DI consumption. The system will work as intended increasing filtered water production rate and decreasing the amount of waste water, but the overall amount of TDS that comes out of the system may be slightly higher than a single membrane system. Because of that your DI consumption will increase. We do recommend using two DI canisters for 150 GPD systems. **Drinking Water RO Systems - When filling up the pressure tank will increase the back pressure, in turn will take longer to fill and increase the waste water produced by the RO system. We highly recommend a permeate pump for these applications to minimize waste water. Upgraded my CoralVue IceCap from 100 to 200 GPD output primarily for speed since I'm forced to fill 5 gallon buckets in the kitchen sink area. Saving a ton of water in the process was a welcomed benefit. Upgrade was easy after watching a couple instructional BRS videos on youtube and now I am getting about 170 GPD @ 60 degrees water temp (roughly 6-7 GPH). I'm lucky to live in the Atlanta area with 32-50 TDS out of tap, so adding a membrane only increased my TDS output of "0" with 1 membrane to a TDS of "1" with this saver kit. As a note, I do have a booster pump running about 85 and it dropped my pressure about 10lbs/sq inch so for those who are running lower pressures may want to consider a other options. Here in California we try to conserve as much water as possible. This upgrade helps and works great and does what it should do reduce waste water and increase product water output. It has everything needed to install. There's a video to show you how to install it if needed which is a plus. I would definitely recommend this to a friend. Only minor drawback is maintaining 2 membranes and a way to monitor each one independently from each other to see which one is depleted. For me recycling the waist water is more important. My only regret about the 150 GPD upgrade is not buying it sooner! I purchased primarily to reduce the amount of wastewater. The added speed in making water is a fantastic bonus! With the upgrade, I'm still measuring a TDS of 1ppm after the membranes! I highly recommend to anyone who has the pressure to run the dual membranes. I primarily got this to reduce the product to waste ratio as I'm on a well. It does a fantastic job at that. It went from about 3.5:1 to almost 1:1. This kit is killer. combined with a booster pump running 80psi im producing ro water faster than ever and at what seems a 1:1 ratio. Only downside was that when I hooked water up one of the elbows was leaking the threads were actually cracked like it got knocked during shipping or something. Ran to get a new fitting and good as new. not BRS fault im sure but maybe ship these kits with the elbows not installed to prevent future damages? Does everything as said it would. Great item makes water faster than any other rodi unit I’ve ever used. So happy I bought this. Exactly as they say. Watch the video. It’s well worth the cost. I wish I would of got this sooner. Water faster. I would give it 5 star but it wastes more water. I would for sure recommend this upgrade to everyone. I have had my system for about 6 years now and required a booster pump due to the pressure being so low. We were getting about 25 gallons in about 12 hours. We moved just a few months ago and the pressure is a lot better at the new location so I added this 150 kit on back in September and now I am getting 30 gallons in under 4 hours and very little waste down the drain. Great add on! I have a base 4-stage RO system from Water General that I have used for years. Most recently I have been using it to produce brewing water since I have been out of the reefkeeping hobby a few years. Before this upgrade, I had a 3:1 rejection rate from softened water, 4 gph yield and chlorine of 4 ppm. After this install, my rejection rate is now 1.4:1 with 7 gph yield and no chlorine. A valuable upgrade. Great so far. I gave it 4 stars until I see how well it performs. We do have a great video that can be found at the link below that shows how to convert to the water saver system.